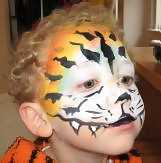 Iris is an award winning international face and body painter based in Brooklyn, New York. She was an art teacher and art coordinator for the NYC school system for 25 years, and a face and body painter for the past 10 years. Iris loves her work. Iris loves to work with children of all ages. 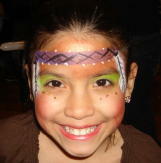 Iris uses professional face painting make up that is used on professional actors and actresses. This make up washes off easily with warm water. Iris can face paint twenty full faces in one hour. 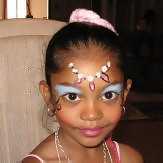 If there is time left, she will face paint the adults.